Get in close without the irritation. The nourishing power of grapeseed oil, argan oil and castor oil softens even the toughest beard, while tea tree oil helps fight irritation. The result? An ultra-close and comfortable shave. Helianthus Annuus (Sunflower) Seed Oil*, Simmondsia Chinensis (Jojoba) Seed Oil*, Octyldodecanol, Argania Spinosa Kernel Oil*, Coco-Caprylate/Caprate, Sorbitan Oleate, Abies Sibirica Oil, Citrus Aurantium Bergamia (Bergamot) Fruit Oil, Citrus Aurantium Dulcis (Orange) Peel Oil, Citrus Limon (Lemon) Peel Oil, Eucalyptus Globulus Leaf Oil, Eugenia Caryophyllus (Clove) Leaf Oil, Helianthus Annuus (Sunflower) Seed Oil Unsaponifiables, Juniperus Virginiana Oil, Lavandula Hybrida Oil, Melaleuca Alternifolia (Tea Tree) Leaf Oil*, Pogostemon Cablin Oil, Ribes Nigrum (Black Currant) Seed Oil, Ricinus Communis (Castor) Seed Oil, Vitis Vinifera (Grape) Seed Oil*, Aloe Barbadensis Leaf Juice*, Cardiospermum Halicacabum Flower/Leaf/Vine Extract, Rosmarinus Officinalis (Rosemary) Leaf Extract, Tocopherol, Tocopheryl Acetate, Bisabolol, Caprylic/Capric Triglyceride, Heptyl Glucoside, Polysorbate 20, Triethyl Citrate, Citronellol, Eugenol, Geraniol, Limonene, Linalool. Gently squeeze 4-5 drops (or more as needed) of oil into your hands and massage into skin. Shave in the direction of hair growth. After shaving, simply pat your skin dry, no rinsing required (the remaining oil will help moisturise the skin). 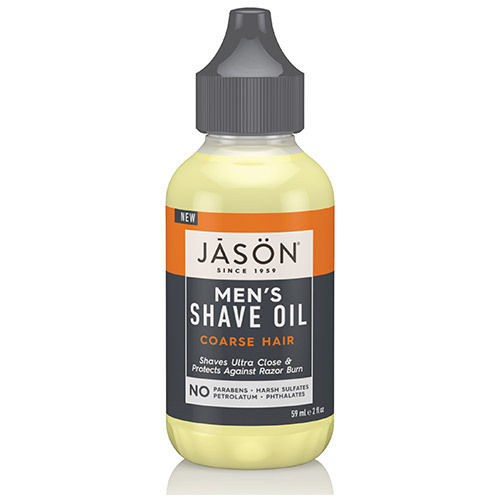 Below are reviews of Jason Men`s Shave Oil - Coarse Hair - 59ml by bodykind customers. If you have tried this product we'd love to hear what you think so please leave a review.